I’ve been dreaming and scheming for a number of years now. Not that you would know it, by looking at my front garden. I have a small yard, and that’s my entire problem. You see, I want cherries. In my yard. And I can’t have them. Ten years ago, I was looking for an attractive, small tree to put in my front yard. I wish I had known more about cherries back then. The only cherries I knew of were the Nanking cherries, and I wasn’t interested in a large shrub taking up a large portion of my space. Nanking cherries are in the 6 foot range, generally growing as tall as they are wide. They have beautiful, fragrant spring blooms and the fruit makes lovely jam and pies, but can also be eaten out of hand. The tart fruit is small, only ½ an inch or less, but a single bush can yield over 10 pounds of fruit. The Nanking cherry is a lovely specimen plant, but also makes a beautiful hedge, as does the Prinsepia cherry. Both should, however, only be pruned after blooming, but use gloves while pruning the Prinsepia to protect yourself from the spiny branches. The Prinsepia cherries are also edible (although tart) and the birds do love them. The shrub turns a beautiful gold in the fall. Its size is similar to the Nanking, so it still would not have been a good choice for my yard. But then I met Evans. (The Evans cherry, to be specific.) Named after the plant researcher who found it, Dr. Ieuan Evans, it is everything I’ve ever wanted for my small front garden. It is a small tree, growing to a height of about13 feet, with a spread of 10 feet. 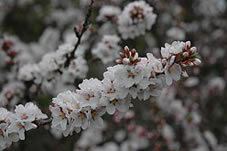 The tree flowers with masses of white blooms in early spring, and the fruit is large (1” in diameter) and is excellent for baking, jams and wine. It also has excellent flavour eaten right off the tree, however, the longer the cherries are left on the tree, the darker and sweeter they become!The foliage turns a beautiful yellow-orange in the fall. It is self-pollinating, and ripens by mid-summer with a very good yield. It even has an interesting history; the cherry was found by Dr. Ieuan Evans, growing in an established orchard northeast of Edmonton since 1923. He took some suckers from the trees, began propagating them, and now, it is the No. 1 selling cherry tree in Canada. Even though the Evans cherry is my favourite, I should try to be a bit more impartial, because there are many more wonderful, hardy cherries that have been bred for the prairies. The University of Saskatchewan has come out with a cultivar called Carmine Jewel. 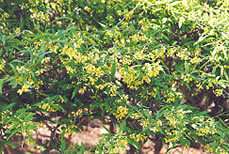 It is an 8 ft by 6 ft shrub that also has ornamental value; very large flowers and glossy leaves. The cherries are dark red, almost purple, and moderately sweet (brix 17). This cultivar is the earliest to ripen, during late July. The fruit is good for fresh eating, jams and jellies, and wine. In fact, the University of Saskatchewan has been breeding sour cherry cultivars for over 60 years. The two sweetest cherries of these cultivars are Crimson Passion and Romeo. They both have a brix 22, but the Crimson Passion ripens slightly earlier with larger fruit, is shorter by a foot (at 5.5 feet) and the least likely to sucker. Unfortunately, they are both a little less hardy when they are still “young.” Crimson Passion has been known to produce fewer cherries, but the fruit has the best texture. If you are most interested in harvesting for juice, Romeo would be the best choice, as it also has a high yield. Cupid is the latest to ripen, with the largest fruit, moderate sweetness and good flavour. Juliet and Valentine both ripen early to mid-August, with similar size fruits. Juliet is the second sweetest, so it is very good for eating fresh, but also for processing. 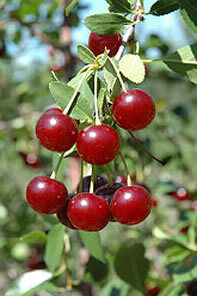 Valentine is the most tart of all the cherries, coming in at a brix 15, so it is mostly recommended for cooking and jam. It is also the most prone to suckering, and the tallest at 8 feet. All sour cherry cultivars are self-pollinating, which is good if you only have room for one plant. For the most part, the cultivars are moderate to high producers, but you may have some competition from the wildlife – birds and chipmunks enjoy them, too. Fruit production will start within the second year. The lifespan of the cherry trees and shrubs is about 30 years, with a medium growth rate, so you’ll be enjoying your cherry harvest for a very long time!